For Best Modern Album Tori was #10 with Little Earthquakes. The Entertainment Weekly Web Site allowed people to continue voting on these categories through June 1, 1999 and after that Tori ended up as #5 for best modern artist, #7 for most underrated artist, and #9 for the best modern ablum (Little Earthquakes). Thanks Susan! The Official Alanis Morissette web site added a press release on May 15, 1999 announcing a new Tori and Alanis site called alanisandtori.mp3.com . (Looks like they changed the name, earlier they said it would be called just alanisandtori.com.) You can read the press release at the Alanis site or in my Article Archives. 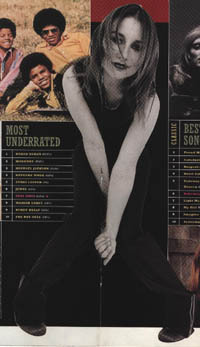 I would like to thank everyone who may have voted for Tori in the Boston Phoenix 1999 Best Music Poll. Marla Antigone informs me that Tori was voted "Best National Female Vocalist" in that poll! Check out the Boston Phoenix Web Site to read a small article about Tori and see a small but nice photo. The 16 songs on the album will feature rare, live or unreleased cuts from all the acts. "Pearl Jam will contribute covers of J. Frank Wilson & the Cavaliers' "Last Kiss" and Arthur Alexander's "Soldier of Love," both of which will appear separately on a benefit single; the songs originally appeared on a Pearl Jam fan-club single." Three international organizations will benefit from the album. They are Doctors Without Borders, OXFAM, and Cooperative for Assistance and Relief Everywhere. They will receive an initial donation of $1 million from Epic Records as well as future revenues from the project. Go to the Sonicnet web site to read the entire article. An interview with Tori appeared in a Spring 1999 issue of the Columbia House Magazine, a publication sent to those who are members of the Columbia House CD club. This interview was conducted sometime in 1998 during the Plugged '98 tour. It also appeared online at the Columbia House Online web site . You can read it in my Article Archives. Special thanks to Kevin K. Crays and Alice for sending this to me. Emma + Andy from the UK were the first to tell me about this, and JB Bridge also provided details. The May 1999 issue of Mojo Magazine (with ABBA on the cover) has the results of "The 100 Best Vocalists of All Time" reader's poll. Tori was #75 on the list! Russian Magazine "Caravan Of Stories"
This adorable photo that I have never seen before comes from Toriphile Olga and is from the May 1999 issue of a Russian magazine called "Caravan Of Stories" It was part of an article about photographer David LaChapelle. He was the photographer who shot the photos of Tori that appeared in the June 25, 1998 issue of Rolling Stone. I and several others think that this picture is an extra from that same photo session. Other Toriphiles think the photo is an older one from around 1994. I wonder if we will ever know for sure? Click on it to see it larger. The photo of Tori was one of about 5-6 photos of famous people. I know from Shulamis that Tori is wearing an outfit by designer Issey Miyake. Francesine Hiltz and Rob F. reported that Tori has an article in the May 7, 1999 issue of Goldmine Magazine. (Vol. 25, No. 10, Issue 490). On the cover of this issue there is a small photo of Tori and the headline "Tori Amos Hard to Peg." The article is on pp. 14-15 and is titled "Talk Talk" with the subheading "Tori Amos and the evolving on her songs." There are three pictures including the YKTR cover and one from the Past the Mission single. Both Francesine and Rob sent me the text of this article and you can read it in my Articles Archive. "Tori Amos is checking back into the choirgirl hotel: The singer plans to release a three-CD set in early fall. The as-yet-untitled project will include two discs of live material culled from Amos' 1998 US tour and a disc of all-new material, which Amos is currently recording near her home in Cornwall, England. 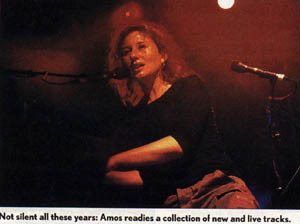 Amos' 1998 tour was her first with a backing band. Her manager, Arthur Spivak, says Amos was so pleased with the results that she decided to document them. 'It was a special tour, and she taped the show every night', he says. 'Plus there are hundreds of bootlegs out there, so she decided to give something back to the fans, instead of watching them ripped off'. Of the new songs, Spivak says, 'She got on a roll in the studio, and the songs just fit with the live material'. Amos plans to release a single from the collection in mid-August, prior to pairing with Alanis Morissette for a five week US tour. Spivak would not confirm the dates, saying only that they 'looked likely', but promoters and agents contacted said the tour is a done deal" - Matt Hendrickson. "Tori Amos was one of the decade's weirdest superstars, manhandling her piano the way Jimmy Page manhandled his guitar and using her high, sweet voice to tap into the most sacred American mysteries. She shattered the stereotype of the saccharine piano girl, turning rock conventions upside down and setting the table for the Lilith Fair audience. Her second full-length album, Under the Pink, is perhaps her strongest collection, inviting you to guess the riddles behind her eccentric melodies and cryptic lyrics. Along with her finest ballads, Under the Pink offers two monster rockers: "Cornflake Girl," a sly high school fable, and "God," which asks the Supreme Being if he needs a date." EWF Cristina first informed me that the May 1999 issue of Keyboard Magazine contains a one page interview with Tori. It's called "Five questions with Tori Amos."